Looking for Christmas gift inspiration for the home lover in your life? We understand that choosing a present for an interiors obsessive (especially those who seem to have everything) can be a challenge, which is why we've stepped in to share our pick of the best gifts for home lovers. Whether their style is minimalist, maximalist or somewhere in between, you're sure to find something unique to gift this Christmas. Crafted from lightweight concrete, this gorgeous mechanimated weather clock from Bramwell Brown makes for an unusual gift that promises not to go out of vogue as interiors trends come and go. Although inspired by grandfather clocks, it's part old-school barometers, too, using changes in air pressure to forecast the weather through beautifully illustrated images. Available with a variety of frames and face designs, we particularly love the industrial feel of this limited edition concrete finish. With happiness inducing properties, these Moroccan Wool Pots from Bohemia Design would make the perfect addition to a home with a white colour scheme – or as a gift for an interiors obsessive with eclectic taste. Perfect for storing knick knacks, or for housing small (but special) house plants, we're sure they would make a welcome addition to any home. While we're on the subject... lots more house plant display ideas in our gorgeous gallery, too. Got a friend with a passion for all things astrological or astronomical? This is the perfect gift. Depicting some of the best known constellations against a backdrop of lush blue velvet, this Constellation Cushion from Oliver Bonas would make a tasteful addition to a bedroom or living room. Looking for the perfect gift for a home lover that has everything? House plants are a go-to option, adding interest to a space and encouraging positive energy – honestly, it's been proven. We absolutely love this Mini Indoor Planthouse Kit from Another Studio; its ornate metal structure providing a pretty, but practical home for a teeny tiny plant friend. With gin growing in popularity (and rightly so) we love the idea of gifting a pair of gorgeous glasses to fellow gin enthusiasts. Find this gin goblet set (of two) at Oliver Bonas. Looking for the perfect accompaniment? Pair with Edinburgh Gin's Rhubarb and Ginger Liqueur or Firebox Flamingo Tears Pink Grapefruit Gin and hey presto, gift perfection. According to the headlines, cacti are the new pineapples, meaning they're guaranteed to make a great gift for interiors obsessives this Christmas. We love this Cactus vase from Abode Living, which looks equally as impressive paired with long stemmed leaves as it does on its own. Trying to find a gift for a friend who can't get enough of Scandinavian design? This White Marble Bar Lamp from Hurn & Hurn is stylishly minimalist in its design, allowing a large, open bulb to make a statement that's striking yet understated. We want it creating the perfect Scandi style room. An ideal gift for a colleague or friend who works from home, terrariums are effective in sprucing up and injecting life into a tired looking desk space. Teamed with a stylish succulent, it doesn't get much prettier than this Geometric Terrarium from Not on the High Street. A simple, but sentimental gift that's perfect for a good friend, we love the idea of filling these Delicate Hanging Glass Frames from Cox & Cox with memories; be that a photograph, postcard, pressed flower, ticket or wedding invitation. 'Tis the season for nights snuggled up watching Christmas films, meaning this Textured Bobble Throw Blanket from Anthropologie makes for the perfect addition to an interiors lover's home. Success guaranteed. Like the idea of a skilfully handcrafted gift that has the added benefit of supporting a great cause? This Divine Inspiration Luxury Scatter Cushion from Arthouse Unlimited supports the work of Arthouse Unlimited, a collective of artists living with complex epilepsy and learning difficulties whose passion for producing artworks is channelled into the production of designer items. This gorgeous example features the artwork of Peter Andrews. Have a friend that loves Instagramming their home? This Gold Letter Board from Oliver Bonas could be the gift for them. Perfect for styling with cute catchphrases, shopping lists or messages for your other half, they're a stylish addition to any contemporary home. We know we would say this but Real Homes magazine is a fab read – as well as being a great reference for anyone looking to transform their home. A subscription means your giftee will have all the latest on updating their home, whether owned or rented, and whether they're on a budget or splashing out on a forever family home. It covers the latest decorating trends, too. Do they love period or vintage decor? Why not double up with a subscription to Period Living mag too? You know it makes sense. With a stylish, copper-toned finish, we love the Moroccan influence behind this gorgeous Kasabah Mirror from Cox & Cox. Its lightweight design and unique shape make an understated impact that's perfect for a bedroom, living room or hallway. The best Christmas presents are those that the recipient would love, but probably wouldn't buy for themselves. Enter the gorgeous Eres range from Anthropologie. Pick from a Pie Dish, Measuring Cups, Spoon Rest, Salt and Pepper Shakersor Butter Dish, each adorned with intricately designed, floral patterns, and spruce up the kitchen of the home lover in your life. 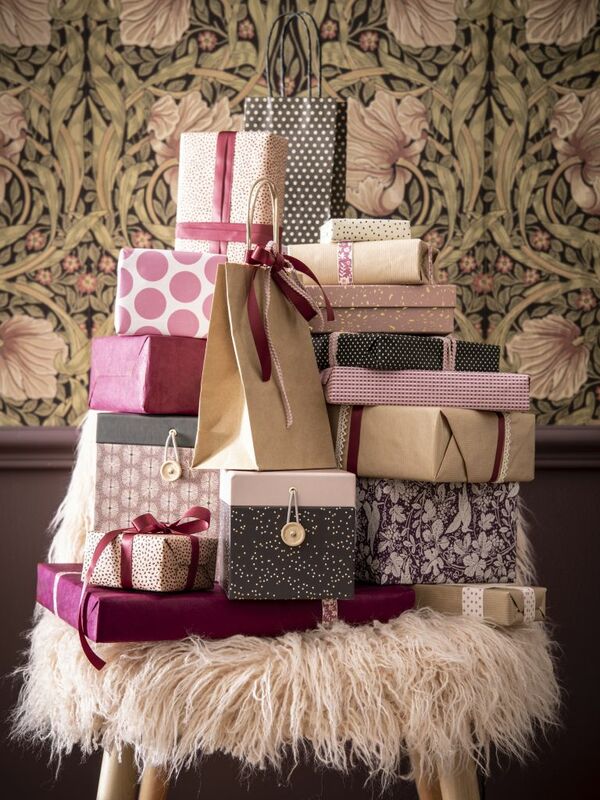 When it comes to choosing gifts for the home owner who has everything, thinking outside of the box is key. We love this Smeg Dolce & Gabbana Kettle, with its vibrant, Italian inspired design. The unique and luxurious feel of this designer item makes it a special gift for Christmas. Don't fancy the kettle, why not try the Smeg Dolce & Gabbana Toaster instead? For friends or family members whose taste is more industrial-inspired, this set of on trend terrazzo Hakuun Planters from Made makes a stylish gift. The perfect platform for plants that need to live indoors, planters allow you to make more of a feature from your green friends, while ensuring the home doesn't feel cluttered. Pssst! Tell your friends they can look for house plant display ideas in our feature, too. If you know a home lover who enjoys cooking too, this gorgeous Parrot Cotton Apron, designed my Sara Miller and available at Amara, makes the perfect gift. Bringing a taste of the tropics into your kitchen, its vibrant parrot design is sure to brighten up even the gloomiest of winter evenings. Find more gorgeous gifts for foodies in our guide. Was there ever a better year to gift a Keith Haring print than the year that he would've seen his 60th birthday? Best known for his use of art to explore political and societal themes – namely homosexuality and AIDS – Haring's colourful prints make a stylish gift for anyone with an interest in art. Pick up Untitled by Keith Haring at Made. With Living Coral recently announced as Pantone Colour of the Year 2019, we're expecting to see pinky-orange shades absolutely everywhere during the next year. Make sure the home lover in your life is ahead of the game with this gorgeous Metallic Woven Pommed Cushion from Anthropologie. With 2019 just around the corner, a set of gorgeous Champagne glasses makes a lovely Christmas gift perfect for bringing in the New Year. We love the delicate deign of these Volcania Flutes from Anthropologie. Team with a bottle of bubbly and you've got Christmas sorted.